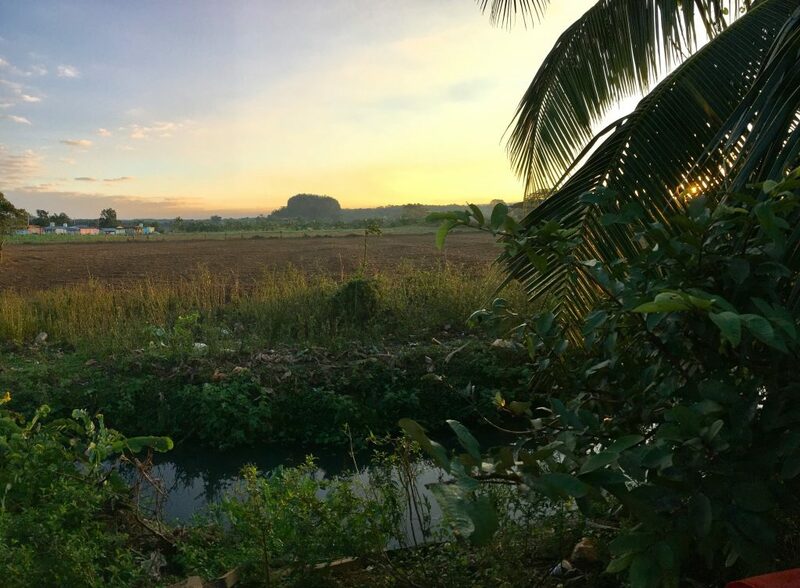 Cuba had been on our travel list for a long time and we wanted to explore the country before the crowds arrive. Cuban tourism is booming; in 2016 it welcomed 4 million visitors which is a 13% increase compared to 2015. After spending 12 days in Cuba, we’re back home with many fun memories and interesting tips and tricks that we want to share with you! Most countries require a visa to travel to Cuba, called a Cuba Tourist card. See a list of countries that require visa. The good news is that you can buy it beforehand, at the check-in desk at your departure airport or via a partner travel agency (contact us for more info). A travel insurance is required to travel to Cuba. Check with your local insurance if you’re covered for Cuba and ask for a certificate. In our case, they didn’t check this upon arrival but they might pick you randomly and if you don’t have a travel insurance, they make you buy it there. Take cash with you! You will need it everywhere. Make a quick estimation of how much you want to spend per day and get your CUCs in the exchange office right outside the airport. All tourist destinations have an ATM so you can always withdraw more cash if needed. Note: check with your local bank if there are any withdraw limitations for Cuba, especially for American citizens. Cuba has two legal currencies: the Cuban convertible peso (CUC) and the Cuban peso (CUP). You will encounter both but as a tourist, you will only use CUC. The latter is paired with the US dollar and 1 CUC equals 24 CUP. Note: a 10% tax rate will be applied if you exchange USD. This is not the case for EUR and other currencies. Don’t underestimate the size of the island: it’s huge! To give you an idea: Havana to Viñales takes about 2h30 in car, Havana to Varadero 2h and Havana to Trinidad up to 4h. This is when you opt for the fastest option: private transfer or a shared taxi, called “colectivo”. You can also travel by bus (Viazul) but make sure to buy your tickets in advance as they get sold out quickly! Traveling by bus is definitely cheaper but much slower as well. We went from Havana to Trinidad by bus and it took us 7h to get there. The driver stopped several times along the route – for what was supposed to be “a quick 35min lunch” which turned out to be 1h! 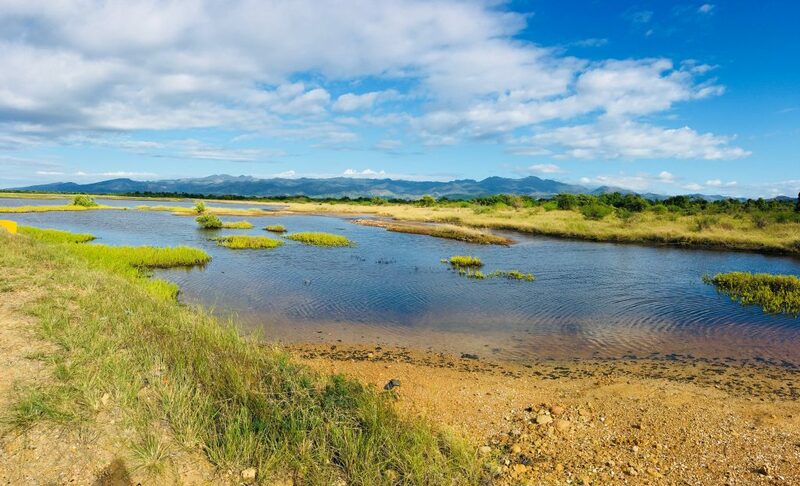 – and drove via Playa Larga and Playa Girón instead of going via Cienfuegos. On our way back, we shared a colectivo with another couple and it took us only 4h. There is internet connection in Cuba although it’s not free as we’re used to. First of all, to gain access you need to buy an ETECSA card which will grant you one hour of internet access. One card costs 1.5 CUC if you buy it at the official ETECSA shop. You will find locals selling the same cards on the streets as well, but at a much higher rate. You won’t be able to access internet anywhere you want, you need to go to a WiFi hotspot, usually at the main square. Here’s an extensive list of the WiFi hotspots all around Cuba. 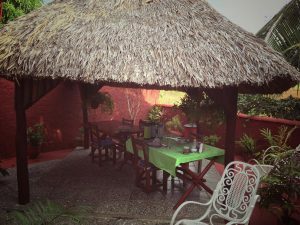 Time saver tip: Buy several cards at Hotel Rancho San Vicente in Viñales and avoid the long cues at the ETECSA office in the centre of the village! This might be the most important advice, yet many people arrive to Cuba without prior booking or research. 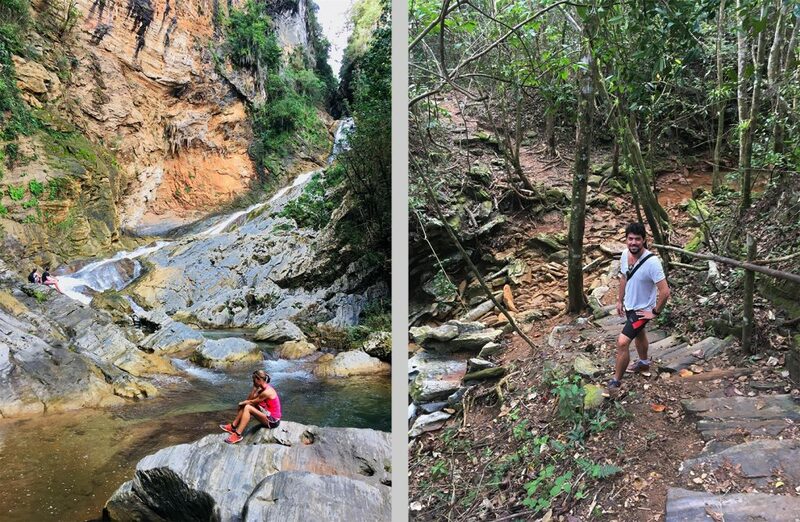 Prime places such as Viñales and Trinidad have limited good hotels and the private homestays fill up fast, especially if you’re traveling in high season like we did (January). Also, internet is limited and slow so it’s not that easy to look up a nice hotel or a fancy restaurant on Foursquare. If you already know your itinerary in advance, then we recommend you to book your accommodation accordingly before leaving. Some people, however, prefer to be able to decide on the road. In this case, you might ask the owner of your casa particular to recommend you a place to stay at your next destination. 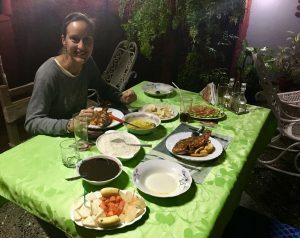 This casa was by far our best experience in Cuba! Alexey and his family are the most lovely hosts – not to forget their cute dog Scooby! – who did their utmost to make us feel at home. 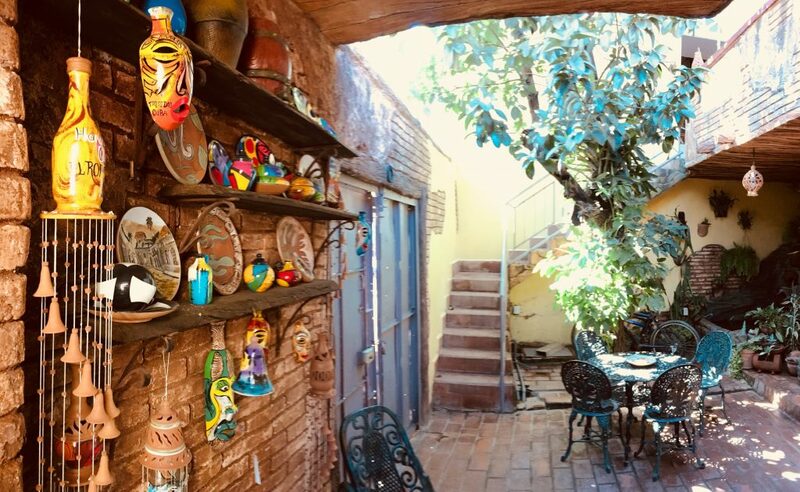 Their house is a very cosy place, with a small courtyard full with ceramic pots (made by Alexey) and plants. The rooms are above the standard of a normal casa particular. 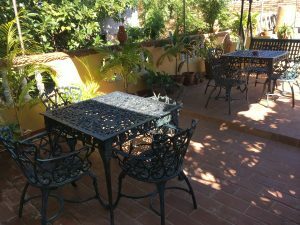 They are quite big with a large private bathroom and a shared terrace where breakfast is served. It’s great to find a spot away from the touristic centre to unwind and relax with a cool beer or piña colada (they prepare the best we’ve tasted in Cuba and believe us, we’ve tried a lot ;)). Make sure to stay at least one night for dinner, it’s the best you’ll have during your trip! The pumpkin soup and fresh lobster are delicious! 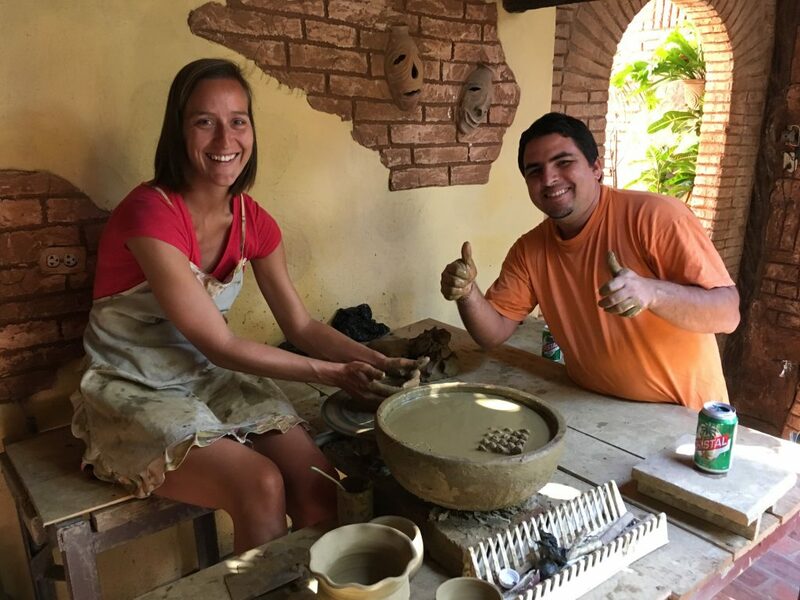 On our last day, we joined Alexey for a really fun pottery class! We stayed here for 4 nights and had the most amazing time! Their house is listed on Airbnb and Booking.com but you better book directly via email: [email protected] or [email protected]. This was the first casa we stayed at as we went straight to Viñales upon arrival in Havana airport. Ignacio and Raiza, the owners, gave us a warm welcome and drove us on their scooter to a local restaurant nearby since we were starving. The location of the house couldn’t have been better; it’s a 5 min walk from the touristic centre, in an oasis of peace and tranquility. The rooms are small yet clean and have their own bathroom. We definitely loved Raiza’s cooking! Breakfast and dinner is abundant and delicious. Unfortunately we couldn’t enjoy the terrace upstairs due to the bad weather but it’s the perfect spot to watch sunset or stare at a sky full of stars at night. One of the best experiences during our stay in Viñales was the birthday party of Carlos, Ignacio’s neighbor and dear friend. 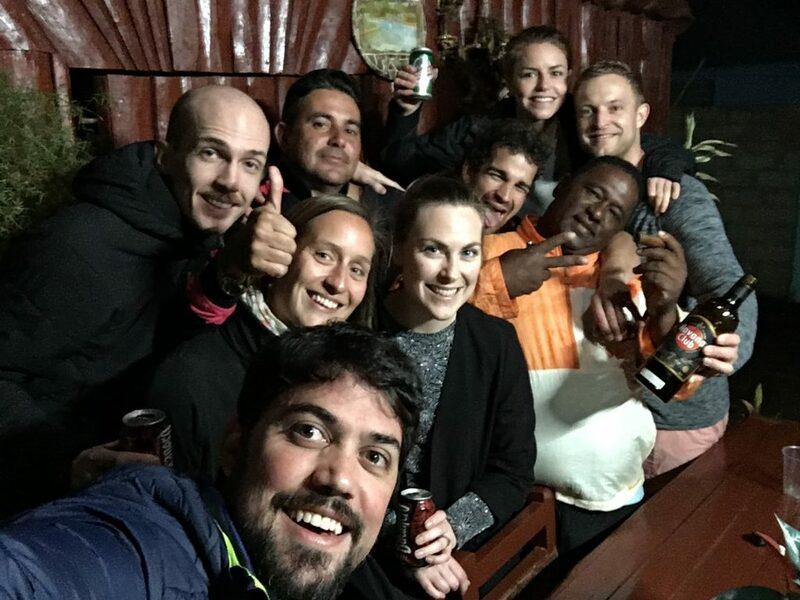 We had a lovely evening with both families and the other tourists and were amazed by the hospitality of Carlos and his family. Their house is listed on Airbnb but you better book directly via email: [email protected]. Our arrival in Havana was a bit disappointing since we didn’t have the right address of the casa and we hadn’t informed Cari, the owner, about our estimated arrival time so the room wasn’t ready yet. Completely our fault! However, our impression changed when we met Cari later in the evening. A strong, warm hearted woman who treats her guests as her own children. She drove us twice to the bus station and even went buying our bus tickets a couple days in advance. 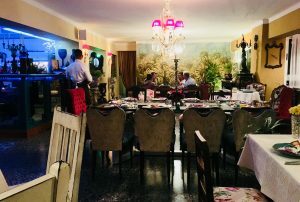 We had a classy dinner at Porto Habana, an elegant restaurant where Cari booked us a table and took us by car. Definitely a must when you’re around! The house is located in the Vedado neighborhood, an urban district that borders to Central Havana. 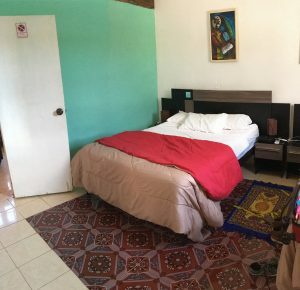 Many tourists try the find accommodation in Havana Vieja or Old Havana but if you choose comfort and a quiet sleep at night, then we 100% recommend you to stay in Vedado. Don’t get us wrong, Old Havana is definitely charming but you’ll find it hard to find a decent place as many houses are old and very small. Cari’s house is a typical colonial building with several rooms that share a bathroom. Don’t expect any luxury, rooms are basic with few natural daylight but clean and large. Cari’s casa is listed on airbnb. We even learned how to roll a cigar … and smoked our first one of the trip! If you haven’t seen or visited any cave yet, then you can stop by the Cueva del Indio but it definitely wasn’t the highlight of the day. We arrived after lunch time and had to cue inside the cave to get on the boat for a short ride. On our second day we took a 4h horse riding trip. The horses were easy to handle and the scenery was great although we found the entire experience a bit overrated. We were expecting to ride inside the valley but instead, only got to see the valley from the top of the hills. 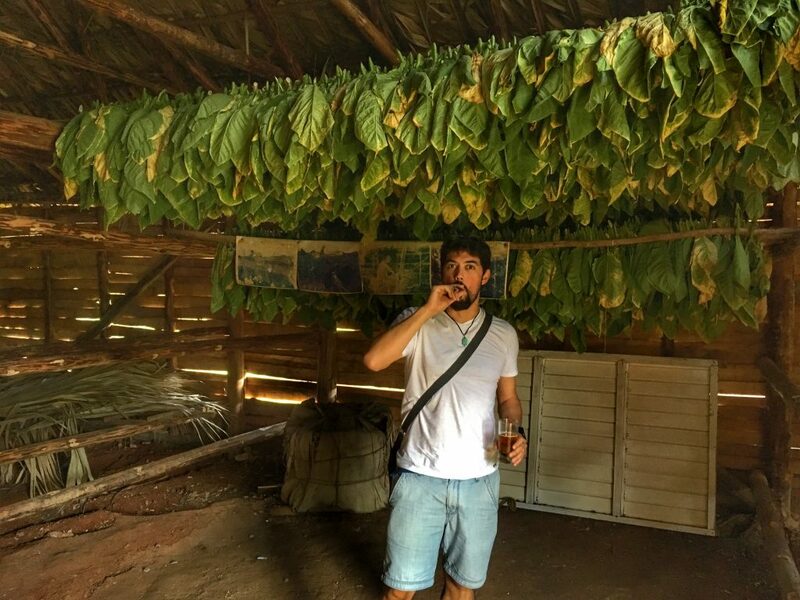 We rode through a tobacco farm where they explained how to roll cigars, produce coffee and honey. Next we went to a top hill restaurant with a nice view. It was entertaining and fun, but a bit disappointing as well as we returned via the same track. 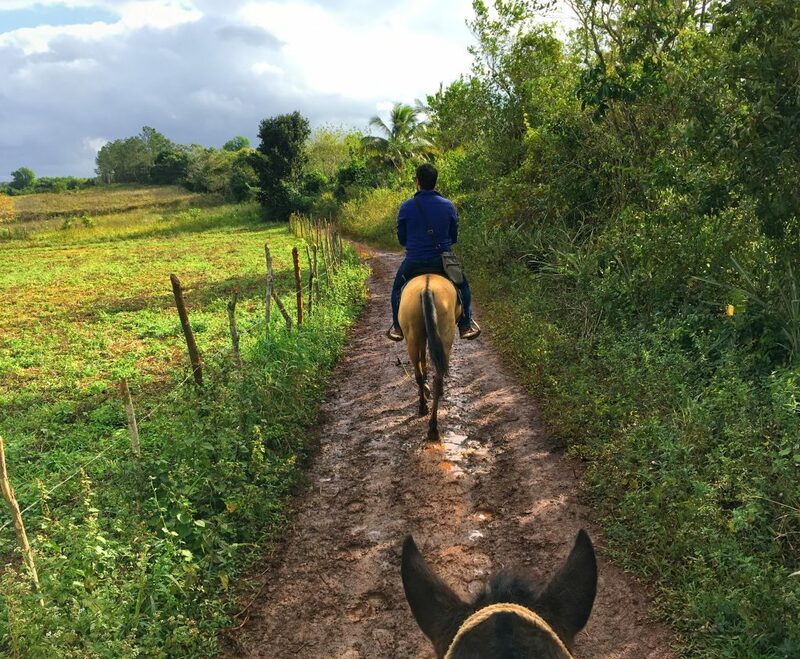 Also, the visits along the route do feel a bit as a tourist trap as literally every horse riding trip stops by the same tobacco farm and restaurant. During our last night we went to explore the nightlife in Viñales and had a blast at Centro Cultural Polo Montañez. This popular night spot is located right at the main square and kicks into action as of 9pm when locals and tourists show their best dance moves. Don’t worry if your not an expert, you can practice and learn from them! Despite the cold and cloudy weather, we took a day trip to Cayo Jutías for a relaxing beach day. Cayo Jutías is located 60 km northwest of Viñales. However, road conditions are very bad so after a 2h long and bumpy ride, we arrived to the beach around noun. The beach itself is very quiet and has all facilities you need (restaurant, bar, toilet with shower) without feeling like a resort. Keep on walking along the beach to find a more secluded spot. Cayo Jutías vies with Cayo Levisa, to the east of Viñales, for the title of most stunning beach. We decided to only visit Cayo Jutías as there are no accommodation options, unlike Cayo Levisa, thus felt more tranquil and isolated. Havana Vieja or Old Havana: Havana’s tourist area. A charming neighborhood full of history, beautiful (and restored) buildings and great art galleries. Central Havana: Located between Havana Vieja and Vedado. The area has some interesting buildings but unfortunately, many of them are completely destroyed or are slowly eroding. In our humble opinion it felt as walking through a war zone. Vedado: The most modern area. This area has large, colonial buildings that are well-maintained and has nice restaurants and bars. 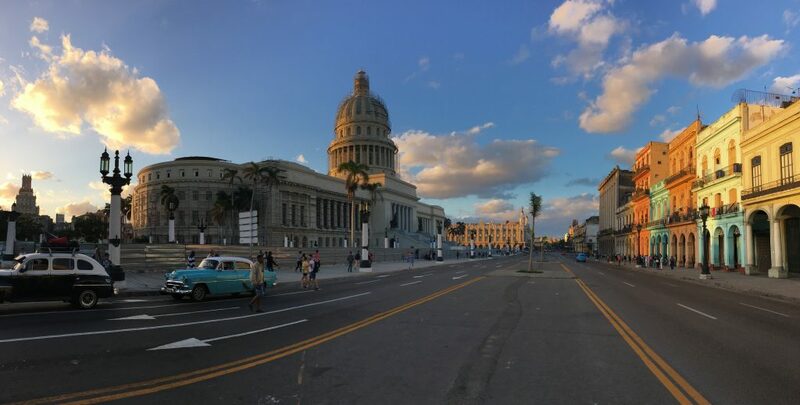 On our first day, we started walking from our casa particular towards el Malecón, the seafront promenade, a long stretch of coast that goes from Vedado, along Central Havana and ending at the harbour in Havana Vieja. We made a quick pit stop at the Hotel Nacional and continued strolling along the Malecón watching locals fishing. 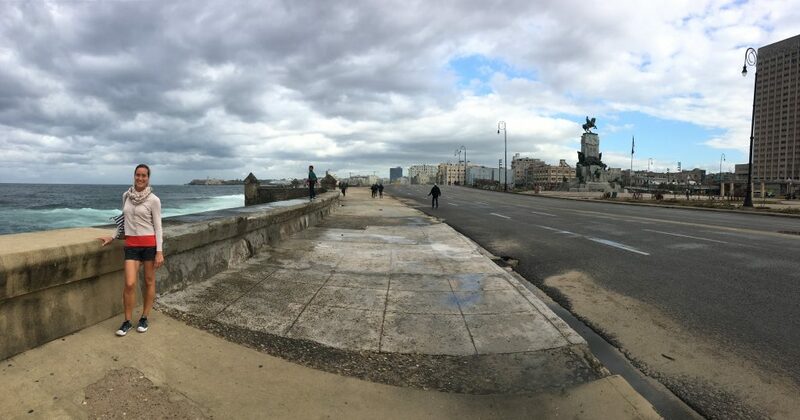 It felt like being inside an epic movie with the strong wind and the water splashing all over the malecón. We made our way into Central Havana and were surprised to see the poor condition of the neighborhood. Many buildings are falling apart or are under scaffolding. When entering Havana Vieja, you get a completely different image. 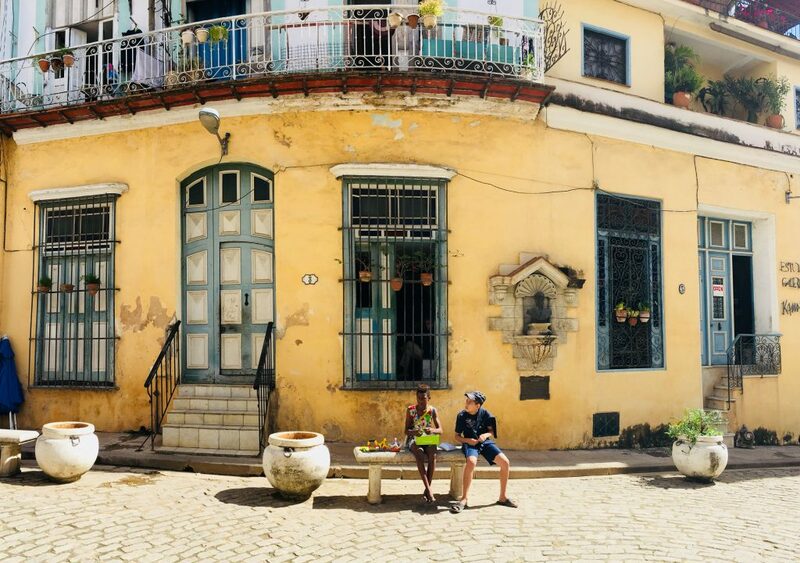 This is the “postcard Havana”; lovely cobblestoned streets, salsa bars with live music and exotic vibes. 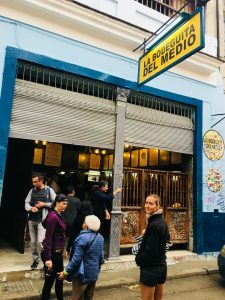 You can’t miss out to sip a mojito at La Bodeguita del Medio or a daiquiri at El Floridita; famous because of Ernest Hemingway who frequented both bars. Being a popular tourist attraction, be prepared for long lines and crowds inside. If you’re traveling on a tight schedule or don’t want to walk that much, then you can rent a classic car with driver to guide you along the main sightseeing points. Make sure to visit the Museum of the Revolution; it’s well-worth a visit but be aware that this is just one angle of the story. Avoid the Havana Rum Museum however, it’s a total rip off for a very short and crowded tour, not to mention the ridiculously small rum taste they give us at the end. Overall, we felt that Havana is a must-see but also a lot to take in at the same time. Although there’s not that much traffic, the car exhaust of the old cars is pretty bad and annoying. 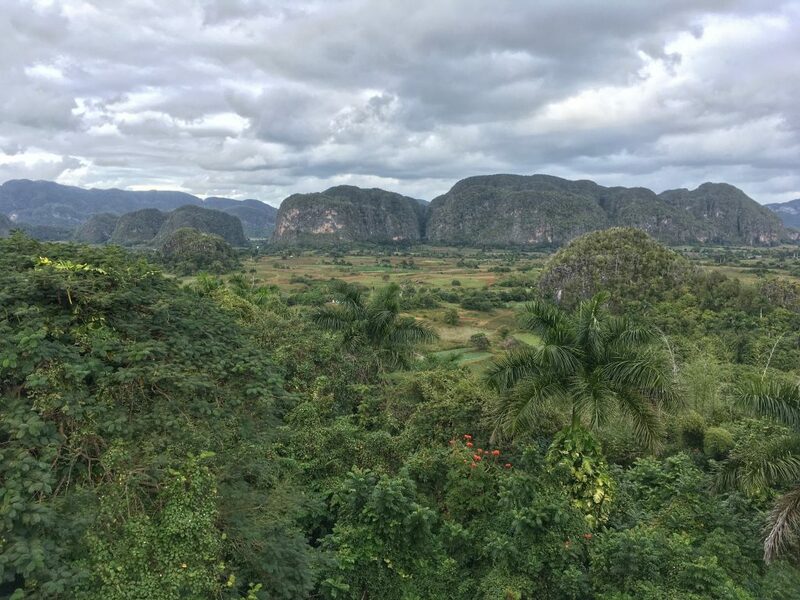 It was a strong difference with the clean air and peacefulness on the countryside in Viñales. Note for families traveling with kids and buggies: You can’t call Havana stroller-friendly, it will be a hassle because of the cobblestones and potholes as well as for the lack of sidewalks. 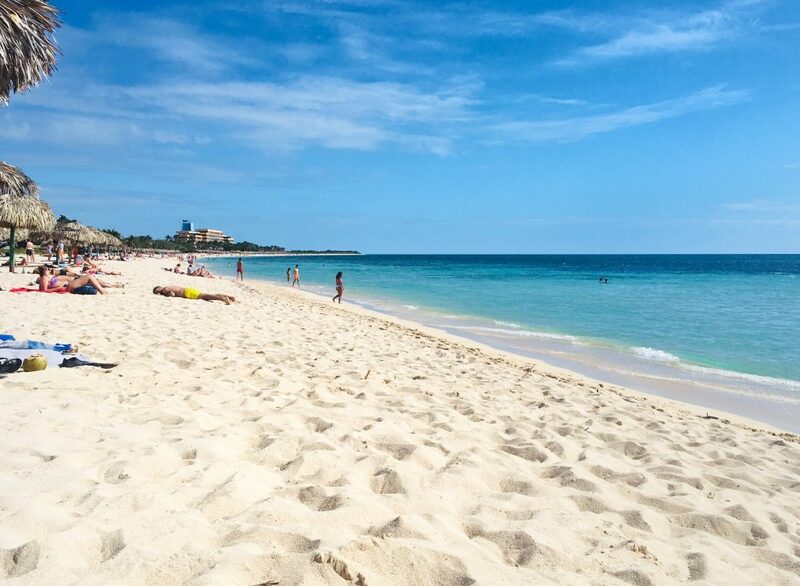 Initially Varadero wasn’t on our list as we’re not keen on large, overcrowded, all-inclusive beach resorts. It’s not really our style of vacation. However, we changed our mind in the middle of our trip as we wanted a break from the hassle and pollution of Havana. We left early in the morning and after some trouble getting a colectivo, we finally arrived to Varadero around 11h. During our taxi ride, we had decided to stay overnight to get the most out of our beach day. We went to a bar with internet connection – quite rare in Cuba – and started looking for options. Finally, we ended up with no luggage or passport at the Royalton Hicacos. This is one of the most sophisticated beach resorts in the area so our expectations were high. While the room was nice and large, the bathroom was a bit outdated. There was a large selection of items at the buffet, with several live cooking stands. 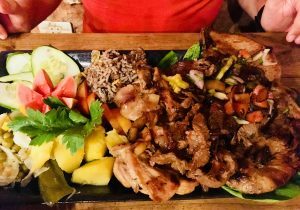 There were several on-site restaurants as well with prior reservation and a dress code – to which we didn’t comply – but the buffet and free mojitos were already more than enough for us! 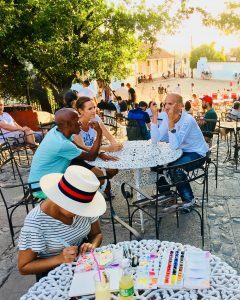 If you’re a first-time traveler to Cuba and you want to immerse yourself in the Cuban culture, then this is definitely not a good way to do so. There’s zero culture exposure. Now, if you’re traveling with kids or as a couple, then it’s a good break from busy Havana. 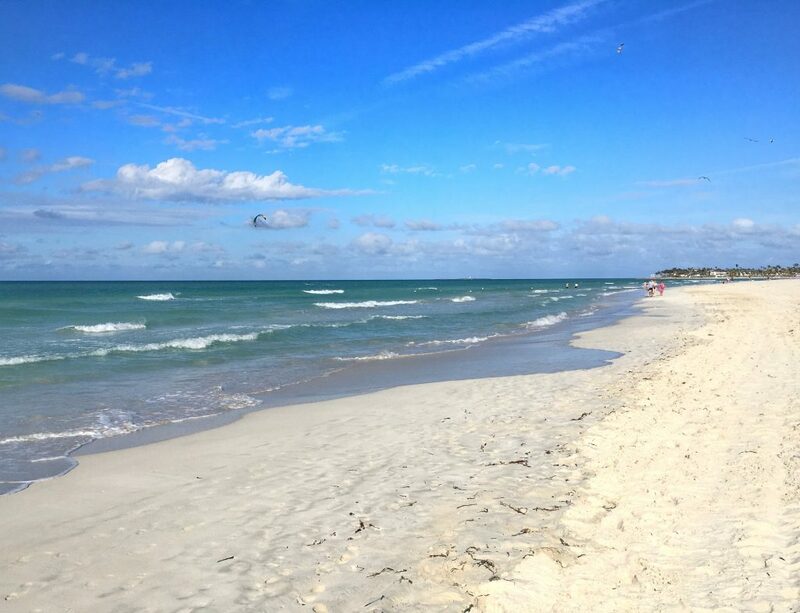 We enjoyed every single minute of our stay but wouldn’t go back to Varadero. 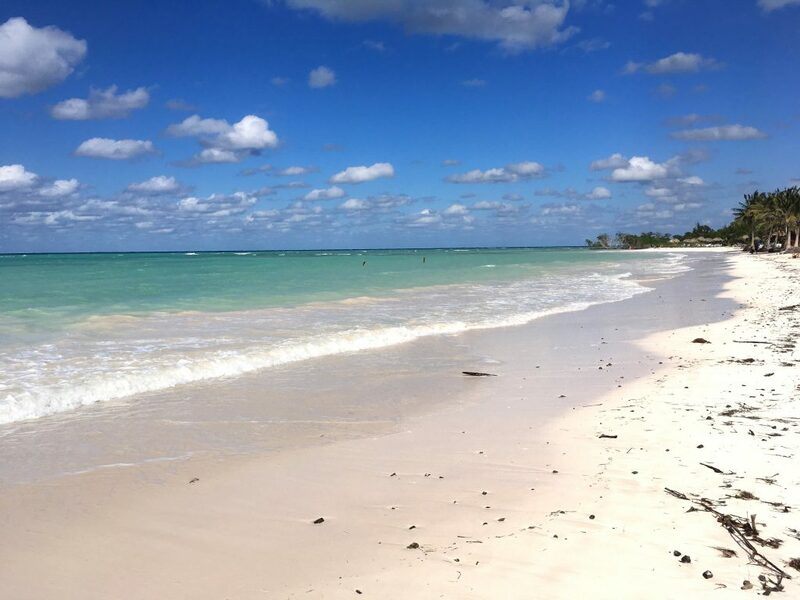 If you’re looking for a beach vacation, then there are many places in the Riviera Maya in Mexico that beat Varadero on price, service and quality. 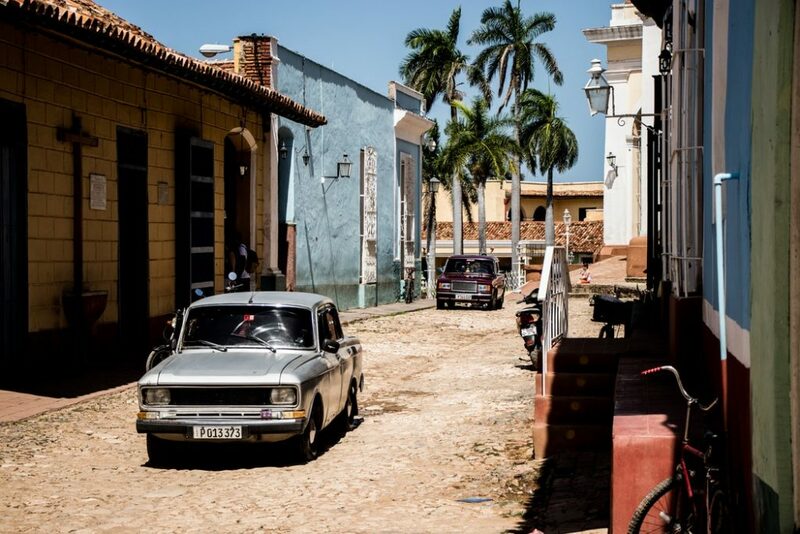 Trinidad is a charming colonial town, 4h southeast of Havana, with the old part being a UNESCO heritage site. The colourful buildings, cobblestoned streets and many salsa bars make it a much desirable tourist destination. We noted this from the moment our bus pulled into town; locals were standing in line and trying to sell us tours and taxi rides. Watch out for tourist traps and ask the owner of your casa for reliable transport options and good dining spots! During the day the tourist centre is quite calm as many travelers go for an excursion outside Trinidad (see below) but once sun sets, locals and tourists gather around Plaza Mayor to soak up the night scene. 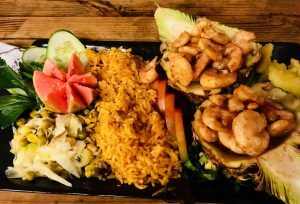 Head for dinner to La Botija, a rustique restaurant with live music which is open 24h. Get there early as the lines get long. Portions are big; we had the grilled meat platter and shrimps and ended up full. After dinner, we headed to Casa de la Música (see left pic), one of the main life performing stages in Trinidad and a magnet for salsa lovers. You pay a small entrance fee (CUC 1) and can sit on the steps to enjoy several bands playing throughout the evening. You can dance all night long and even explore other venues like Palenque de los Congos Reales for some Afro Cuban music or Casa de la Trova, for some Trova music as of 23h. On our first day in Trinidad, we rented bikes (via a friend of Alexey, the owner of our casa particular) for 5 CUC/day and started an early bike ride while enjoying a great scenery. After 8km, we stopped at Playa María Aguilar which you pass on your way to Playa Ancón. 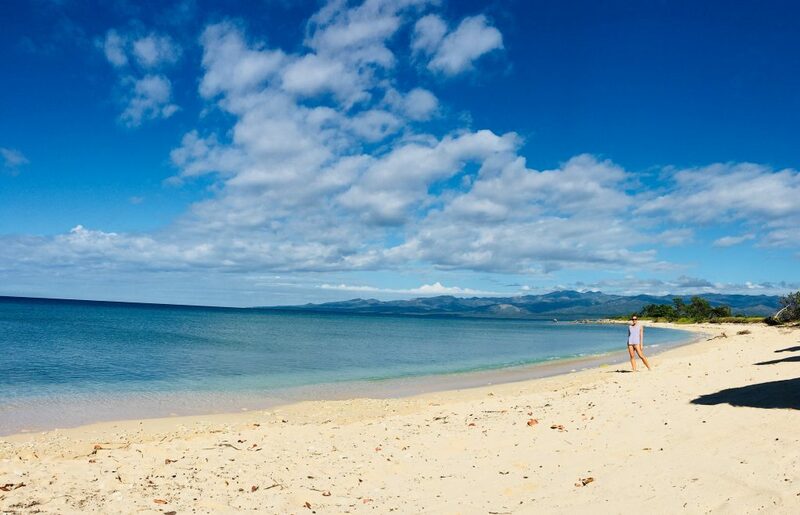 María Aguilar beach is a beautiful and peaceful white sand beach with nice views of the mountains towards the right. Our early arrival (at 9am) made it feel as a private beach. We rented snorkeling equipment for 3 CUC and stayed another 2 hours until it got busier. Two km further away lies Playa Ancón, a lovely long stretch of beach with calm water. There are several small beach bars for snacks and drinks although you should try the homemade pizzas that some locals are selling. Alternatively, you can also take a taxi from Trinidad which will cost you between 6 and 8 CUC (one way) but try to look for other tourists to share the ride (and costs). 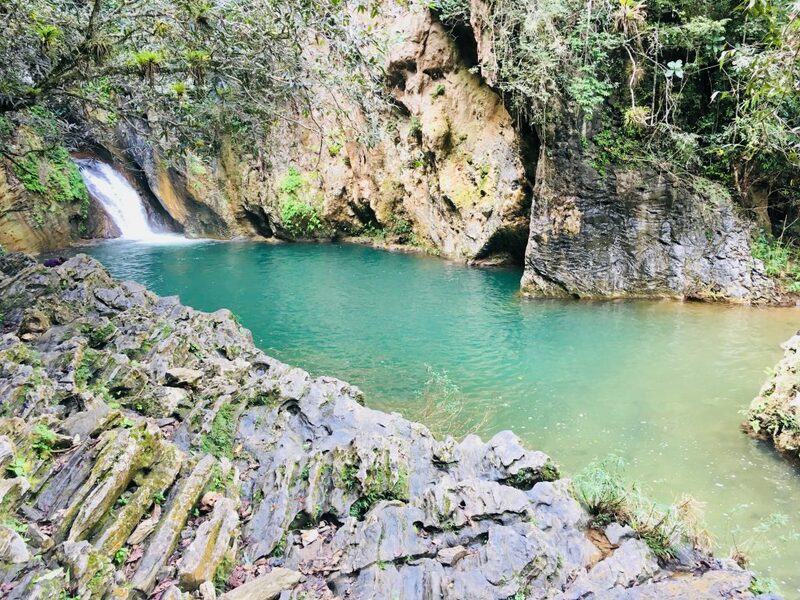 The Sierra del Escambray is home to Cuba’s second largest national park, el Parque Nacional de Topes de Collantes. 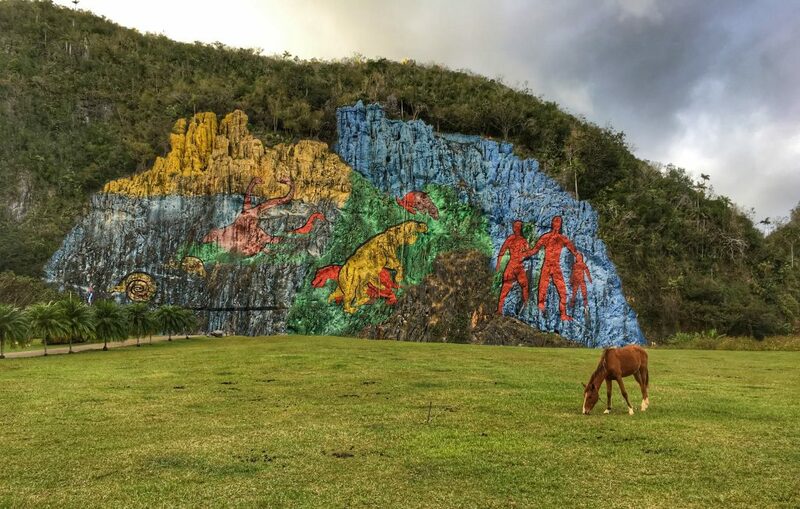 It’s the ideal background for hiking, mountain biking or horse riding. 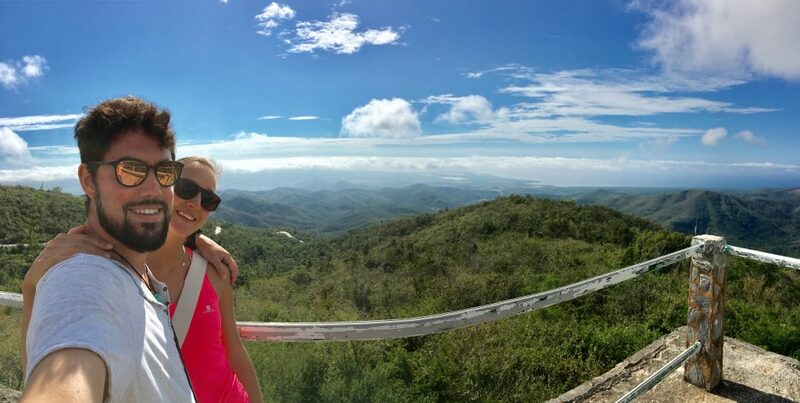 It’s a 20 min ride; but make sure to stop at this incredible viewpoint! Twelve days in Cuba didn’t allow us to discover more places but staying for a while in each of them gave us a good idea of the culture, the people and the system. The best memories from our trip are definitely from the conversations we’ve had with the locals. It’s useful and almost necessary to speak Spanish in order to understand their history, to learn about their day-to-day struggles and to feel the real Cuban vibe. We’ve been hosted by the most lovely people and have received such a warm welcome in every place and it’s their love, hospitality and positive energy that has inspired us. Are you traveling to Cuba in the near future? Are you curious to hear more stories? Contact us without obligation and we will be happy to help you!